PowerApps and Flow are now essential components of the Office365 story and rapidly gaining mindshare and mainstream acceptance. Like many new and powerful cloud-based technologies, PowerApps and Flow enables “citizen developers” to produce sophisticated solutions that would have previously been performed by the IT function or by chosen consultants. 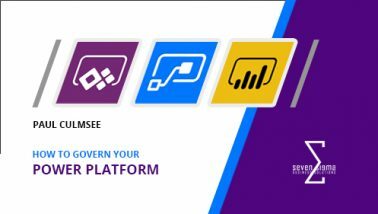 Drawing on a more than a decade of complex problem facilitation, and governance leadership in the SharePoint world, Paul has been working with PowerApps and Flow since it was in beta, with public and private organisations large and small, on solutions that leverage the strengths of the Power Platform in a governable manner. The paradigm of user-empowerment via Citizen developer tools like PowerApps and Flow present great opportunity for organisations to innovate, but at the same time, creates uncertainty about how to effectively manage it. Drawing on his experiences with early adopters and innovators of the Power Platform, Paul will provide both a strategic and tactical focus on governing these tools, as well as cover the latest capabilities provided by Microsoft. For IT decision makers or those who shape technology or transformation strategy, Paul’s advice goes beyond the Power Tools, and provides insights on how you can confidently work with business users to harness their enthusiasm and innovative ideas in an ever-evolving business and technological environment.